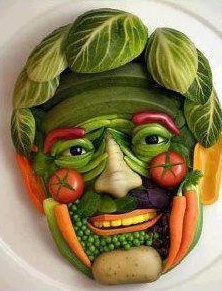 I often get asked if it is healthier to have a vegetarian diet. My answer is, “not necessarily.” I have met a few vegetarians that don’t like most vegetables, so if your idea of vegetarian is eating potato chips all day, then, no, it is not healthier to be vegetarian. It really depends on foods choices, whether you choose to be an omnivore, vegetarian or vegan, any one of them can be a healthy or unhealthy lifestyle. The key to a healthy eating pattern is variety of foods and eating the right amounts of different foods. Here are some tips to eating healthy as a vegetarian. Think About Protein. Protein helps you stay full longer, stabilize blood sugar and maintain muscle mass. 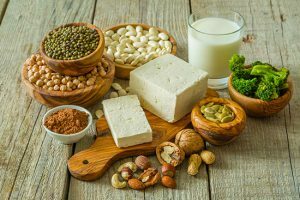 There are many plan options of protein, such as beans, peas, nuts, eggs, dairy and soy products. Make sure to have some protein with each meal. 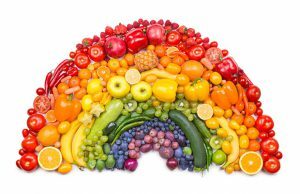 Eat the Rainbow. Vary the color of vegetables you eat. Each color represents different nutrients that your body needs. Get Your Vitamin B12. Vitamin B12 is naturally found only in animal products. Vegans and vegetarians should have fortified foods, add nutritional yeast to foods or take a Vitamin B12 supplement if not eating any animal products. Focus on Omega-3’s. High sources of Omega-3’s are found in fatty fish, like Salmon. The best vegetarian sources are found in ground flaxseed, chia seeds, walnuts, canola oil and soy. Choose Whole Grains. Refined grains are low in fiber, iron and B Vitamins. Whole grains will help you meet your nutritional needs, and fiber will help you stay full longer. Read Labels and Ingredients. Just because it’s vegetarian, doesn’t mean it’s healthy. Know what you are eating! Here is a great recipe that is vegetarian and full of protein, fiber and vegetables. Cook onion, in olive oil over medium heat for 2 minutes. Add garlic and cook for 1 minute. Add sweet potatoes, carrots and bell pepper and cook 5 minutes. Add remaining ingredients, turn heat to medium-low and stir to combine well. Simmer, partially covered for 20-25 minutes, stirring occasionally, until vegetables are soft. Serve warm. Garnish with fresh cilantro, avocado, chopped green onion, and shredded cheese, if desired.